Robert Orlando, President and Director of Nexus Media, has forged an electrifying narrative that exposes an early Christian Church tainted by political resentment, navigated through bribery, and ultimately barely surviving the internal disloyalty endemic to the organization almost from the start. Thirty years after the death of Christ, the future of the Christian church teetered on the brink of an unbridgeable chasm. Two factions with wholly different visions for the Christian mission had clearly emerged: the Apostle Paul’s numerous Gentile Churches and the Judean Church, run by Jesus’ brother James and disciple Peter. The two sides were headed toward a final, and mutually destructive, fracture that threatened to extinguish the Church in its infancy. The stalemate lasted until the Apostle Paul offered the Judean followers the one thing they had little of—money in order to gain their support. 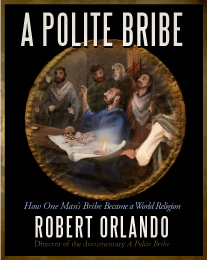 In short, as per the phrase first used by the likes of respected German scholar Gerd Lüdemann, Paul offered the Judean Church “a Polite Bribe.” Paul already had an impressive record of founding successful churches and eliciting generous payments from them. So, solemnly promising the Judean Christians he would return years later with sorely needed cash, Paul departed on his final mission. Fast forward to when Paul did finally return to Jerusalem with the collection after many years. He did not find the open arms he had been counting on; what he found was a Judean Church that was increasingly impatient with him and disloyal to his mission, and also a congregation so angry with him that—perhaps—they even figured large in his eventual assassination. Orlando goes further than suggesting plausibility. His narrative emerges out of his own thirty-year commitment to Pauline studies, and is representative of the core of academia’s top New Testament scholars, many of whom have contributed to his groundbreaking project. Orlando was signed by the Don Buchwald Agency in 2007 to turn his documentary into a feature script. He is eager to set the cinematic record straight, saying, “No one has got this Paul story right on film. We’ve seen religious portrayals, pseudo-historical portrayals, and complete fiction, but no one has taken the time to convey what the evidence points to.” The director has now been working on this project since 2003. He’s been aided along the way by numerous respected scholars, including the late Alan Segal (of Columbia), who, with Elaine Pagels (of Princeton, who also appeared in the film), had been asked to consult on a Paul story some years earlier, when Director Martin Scorsese was in need of scholarly contributions. Orlando is dedicating the film to Professor Alan Segal. Say something about this documentary..
Join in and write your own page! It's easy to do. How? Simply click here to return to Submit Your Documentary.